How to install memcached in WAMP/ Windows ? First of all you need to download memcached-1.2.6-win32-bin.zip. I search a lot and at last got the appropriate package, which you can download from here. Then you need to unzip the package and you will get memcached.exe. Now what you need to do is, paste it in your directory. I have paste it in my E:\memcache\memcached.exe. and my wamp server also in E drive. So now open the directory and right click in the memcached.exe and run as administrator. Since we are using windows 7 so it will show directly in right click itself. Now it’s time to install the memcached in server. To do that, Just open your command prompt as administrator settings and type the path of your executable file and space and –d install then hit enter. Here you may face some problem. 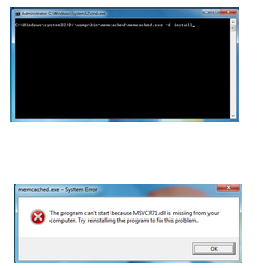 It’s may shows some error like “The program can't install because MSVCR71.dll is missing from your computer .“ Which I faced. Screen shots are given below for your reference. To solve this issue you need to download the MSVCR71.dll file. I searched a lot for appropriate version and finally I got it. Here is the link You can download from here. Download the dll and paste it inside your system 32 folder which is in C:\Windows\system32 and again go to the command prompt and installation process and hit enter. Now it won’t show you any error. So that you are sure that your memcached installed successfully. After insatalling go to services inside control panel and search for memcached server and start the service. 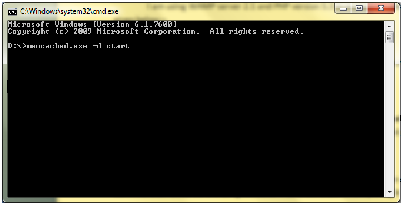 Else you can go to command prompt and type start memcached server. You will get success messege. That’s all you have all steps. Now restart WAMP. You are ready to work with memcached with php. Which will give you good performance. Hope you like this tutorial and my posts. Please do leave your valuable comments and let me know if you are facing any problem installing it. Subscribe blog via RSS so that you will get all my updates when ever any new article will post here and do share. In my next post i will show you how to use memcached with PHP. Please help how can I deal with this issue. To be honest currently I don't have any idea about how to configure memcache class with zend framework. I guess zend is having the inbuilt class to provide caching system. Please follow the class which i provided in my next article. You need to create the class called Memcache and then using that class u need to perform your operation. If you created the above class in your server then just check the file path correctly. Thanks filled in in the missing pieces for me!